Well, I believe that the .300 Whisper has been one of the best kept secrets in handgun shooting/hunting. I picked up a barrel from Bullberry some time ago for my contender but hadnt found any time to get it out and shoot it. I also wasnt ready to scavenge the Burris scope off of my .17 ackley hornet barrel. I recently had the opportunity to shoot it at the range a couple of times and to take it hunting this year. I have been so pleased with it that I figured I would share my experiences here. Before we get started, Ill share a picture of my .300 whisper. I was looking for a handgun that was accurate, pleasant to shoot, and effective on deer-sized game. My first attempt at getting a hunting handgun was a learning experience it was a T/C encore with a 15" .308 barrel. It was big, clunky, and had a mean bark followed by the recoil bite. I got a 7TCU barrel in between and it may have been a good choice as well, but the specimen that I had obtained was not exactly perfect. So that led me to the .300 whisper or .300-.221 as it is also called. This cartridge was developed by JD Jones of SSK industries. 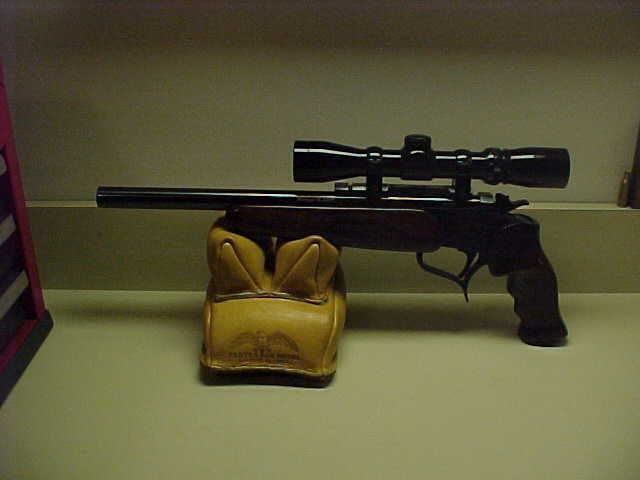 JD developed this cartridge to shoot long, heavy bullets at subsonic speeds: hence the name Whisper. But it does an equally good job of shooting the lighter bullets at supersonic speeds with amazing efficiency. 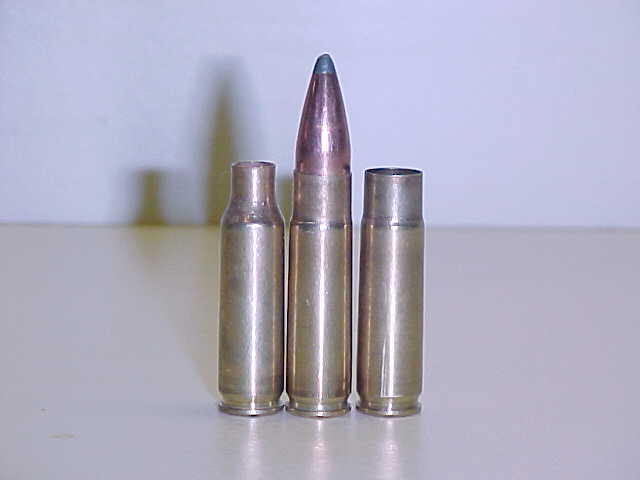 If you look in the loading manuals for the .30-.30 with a 14" barrel, you will see 2100- 2200 fps with a 130 grain bullet. With much less case capacity, I am able to achieve 2150 fps out of my 14" barrel with a 130 grain Hornady SSP bullet. Forming brass is quite easy as well the Redding .300-.221 die set that I bought included an extra expander button that would be used to expand the size of the case mouth to approximately .260 from the .224. 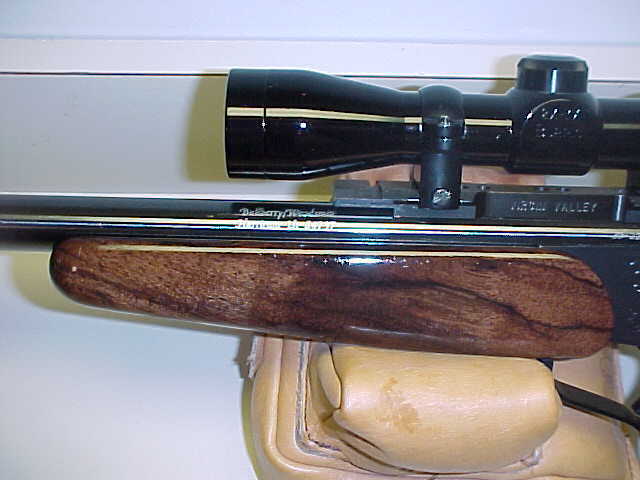 Then the original expander could be replaced and finish necking up the case to .308. Imperial Sizing Die wax is a critical component to this operation as well as a strong reloading press I use a Rockchucker for these tasks. I took a picture of the cases from left to right are: .221 fireball (parent case), formed case loaded with 130 grain bullet, and fireformed case. You can see that it almost looks like a straight wall pistol case when it is formed, with very little shoulder. It is a little difficult finding load data for the .300 whisper but I found a little to go by and started to work up a load. I have only 49 pieces of brass formed for this gun which should prove plenty unless I decide to take it out west for prairie dogs. I chose to use the Hornady 130 grain SSP bullets because that is what I had in my cabinet. I had bought them to use in the .308 and had used a few of them in it until I abandoned that barrel. I also chose to use H110 powder which is the fastest burning powder that I had ever used. I loaded up my 49 cases with increasing charges until I got to a maximum of 18.3 grains. Some reported using charges of H110 of up to 18.5 grains but I found the 18.3 grains to be my most accurate load and didnt feel the need to pursue any additional velocity that the .2 grains might offer. At 18.3 grains, the primers are slightly cratered and flattened. The case extraction is not tight, and the contender frame doesnt hesitate to open. I shot the loads with the increasing charges getting a feel for the gun and shooting some groups. I was pleased at the accuracy of the groups that I was getting as most were 2" or less at 100 yards. When I got to the 18.3 grain load, I fired a five shot group that measures less than an inch and impressed me more than words can express. You can imagine my delight when I walked down range to see this group, as with a 7 power handgun scope, I cant see the .30 caliber holes at 100 yards. 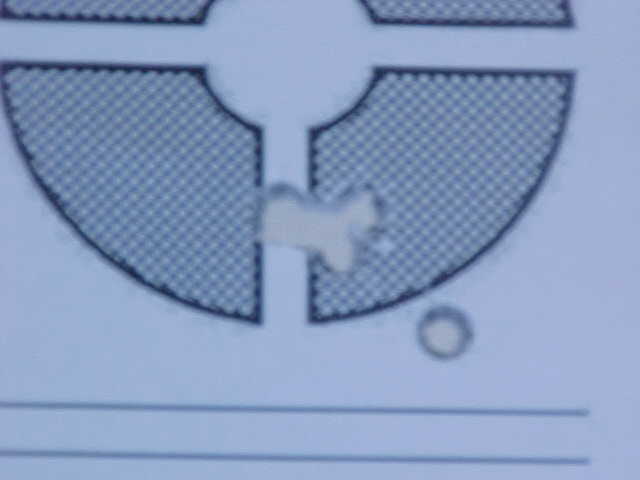 Shown below is a picture of the target. Now for the pleasant part, you can shoot this thing all day long, as it has very little recoil. I wouldnt have dared to take the off-hand shots with the .308 encore that I have taken with this gun already. The other thing that is very pleasant is the relative low level of muzzle blast that is an accepted nemesis of the handgun. I was surprised at the relatively small crack that the whisper had to offer. I dont know how to compare it to other shots, but I would certainly say that it was no more than my .270 rifle that I have hunted with for years. I had every intention of using hearing protection with this gun while hunting but we all know how things happen in the woods. My first experience with the whisper was on opening day of deer season on the Maryland firearms opener. I decided to carry the handgun exclusively and leave all rifles at home for this year. I had set a goal for myself to shoot a deer with a handgun and I was gonna make it happen this year. Since I hunt from a climbing tree stand, I chose to carry a walking stick to use as a rest. I set off early in the morning for my tree stand and climbed up my tree and got set up well before first light. Just as it was beginning to get light, I heard some motion coming from behind me. It was still a little early to see, but I knew that they were coming my way. As luck would have it, the wind was not in my favor. Multiple deer caught my scent and decided that they had better change their intended route. I was a little disappointed at the lost opportunity but sat tight. Just then I heard something coming from the other direction but still couldnt see anything. Then I caught a glimpse of a red fox making its way through the woods. I was not quite ready to get a shot and he never waited around long enough for me to get on him. The low light conditions are not a handgun hunters best times, as the LER (long eye relief) scopes dont gather light like a rifle scope does. It wasnt long before I had an additional visitor. This time it was a big raccoon that was meandering its way through the creek bottom that I was hunting. I had not intended to shoot a raccoon in the prime morning hours but with my blown opportunity at first light, I was feeling like it wouldnt hurt my chances. When the raccoon jumped up on a log, not 15 yards from the tree that I was in he caught me moving to try to get a shot. There was a branch in the way and there he sat staring at me waiting for a move. I sat still and eventually he figured that I wasnt a threat. He moved a little further up the log offering me a perfect shot. I held the contender off hand and centered the cross hairs on his back between as he was quite a bit below me. I slowly squeezed the trigger and fired the shot. At the shot, the raccoon was knocked off the log and quickly expired. I had put in my ear plugs for this shot and didnt like the idea of having to put in hearing protection before each shot opportunity. I certainly couldnt hunt while wearing hearing protection. I sat there for a few more hours with a few deer sightings at great distances through the entanglement of the thick woods which would never offer a shot. At around 9:00 in the morning, a number of deer came running through the woods towards me. I could hear them well before I could see them. One of the deer stops in a small opening about 75 yards away. It is behind me so I am standing in my tree stand and I rest the gun up against the tree that I am in. I steady the gun and settle the crosshairs just behind the shoulder. I gently squeezed the trigger (2 lbs), and fired the shot. After the shot, the deer ran off but I was confident of the hit. As all of the deer ran in different directions, a smaller deer made its way right to me. I hadnt had time to remove the spent shell and replace with a live round before it was 15 yards from me. It caught me loading the gun and sat there and stomped its feet for a bit. It was upwind and had no way of detecting me other than sight. The tree was at my back and I remained motionless until it decided that there was no harm. It continued on its way until I had a perfect opening. Only this time, I was standing and had nothing to steady the gun with. I held up the contender and settled it on her shoulders and squeezed the trigger. Again, this deer ran off but I could tell that this deer was definitely hit. In the thick creek bottom, I was only able to see her go for 50 yards before she was out of sight. On the two way radios, my hunting partners chime in, "What is all of that shootin up there?" I tell them briefly that I would get back to them after I got down and checked it out. When I got down to look at where the second deer was standing when I had shot, the blood trail was plain to see. I followed the trail towards where the first deer was standing when I had shot it. There she lay, hit through both shoulders where I had aimed, bullet exited. I had no problem finding the blood trail from the first deer either, and it had not gone far either. The second deer was hit right behind the shoulders with a perfect double lung shot. A laser range finder was used afterwards to measure the distance, 80 yards. I never had the time to put in hearing protection for the shots on either of the deer and the muzzle blast was not at all unpleasant. I know that the adrenaline was flowing but if I had been shooting my .308 barrel, I am sure that I would have been ringing for hours. I value my hearing and dont at all suggest that you shoot without hearing protection. When possible, I will wear hearing protection with the .300 whisper while hunting, but when time will not allow I will be thankful that I am shooting the whisper and not latest- greatest super magnum. Neither of the deer that I shot may be considered trophies, but the experience will not soon be forgotten by me because they were taken with the handgun. It provides the extra challenge to rifle season that I have been looking for. The .300 whisper is a keeper and I am sure that it will be a favorite of mine for years to come for deer hunting. I may not be able to shoot a 200 grain bullet at 3200 fps, or use up 70 grains of powder and cost $2.00 a shot, but Ill bet that itll be just as effective for my intended use.